From historic Ardmore in Co Waterford to the celebrated Rock of Cashel in Co. Tipperary. The route uses roads, tracks and paths, passing the ruins of many remarkable ecclesiastical sites, as well as holy wells and assorted prehistoric remains. Most of the route is low level, though it has one high section where it crosses the Knockmealdown Mountains. The bustling town of Cashel is dominated by its world-famous Rock. Perched on top of this cliff-bound limestone hump are a ruined Cathedral and Chapel, Round Tower and sundry stone monuments, all within a stout curtain wall. It was the seat of the Kings of Munster before becoming a renowned ecclesiastical site. There are plenty of other interesting features around Cashel, which can be explored on an easy town trail. Leaving Ardmore, St Declan’s Way progresses around a fine rocky headland, then turns inland and commences its journey northwards. The route crosses the Lickey River and there are other walks downstream around Clashmore. The route follows St Declan’s Road and passes through the tiny settlements of Cross, Geosh and Knocknascagh. The ‘Path of the Saints’ converges further along before Cappoquin. The historic towns of Cappoquin and Lismore, the latter dominated by its huge castle, are both easily reached by making short diversions. The ancient Track of St Patrick’s Cow is traced gradually uphill, with a steep and exposed crossing of the Knockmealdown Mountains. Descending through forest, the route crosses the Munster Way near Goatenbridge, and then heads for the village of Ardfinnan. The track of ‘St. Patrick’s Cow’ makes a beeline for Cashel, but is also possible to loop westward and take in the historic town of Cahir and its prominent riverside castle. The name ‘Aherlow’ is derived from the Irish, ‘eathralach’ meaning between two highlands. The highlands referred to are the Slievenamuck where the car park is situated with excellent views of the Galtee Mountains across the valley. Slievenamuck is said to be named after a great pig slain there by Fionn MacCumhail. The area is also said to have been completely covered in oak woods through which roamed herds of wild pigs. These woods were cut down in the 17th century for use in tanning and shipbuilding. Classic Walk: 7.4km (4.5 miles). Climb 250 metres (775 feet). Walking time 2 hours. Park in the Car Park at the top of Slievenamuck Hill. From the Car Park walk north-eastwards along a track that was the old Bianconi Coach Road for 350 metres downhill to STAFFORD O’ BRIEN’S (BIANCONI’S) WELL. Return to the Car Par by the same route. From the Car Park walk eastwards along a track for 2.25 kms until you reach a Forest Road. 950 metres along the track from the Car Park there is a rock cliff on your left (it is 60 metres in off the track) called CARRIGEENINA and it offers excellent views of the surrounding countryside. 550 metres further eastwards of this viewing point there is another rock cliff (it is 40 metres in off the track) on your left. It is called LEAC-A-THORABH(flagstone of the bull). 750 metres from here is the forest road referred to above. Continue straight onwards (eastwards) along the forest road for 200 metres until you reach another junction of forest roads. At the junction, turn right, heading south-westwards and continue along this road for 1.9 kilometres until you reach a tar road at CHRIST THE KING STATUE in the Lower Car Park. Follow the tar road downhill for 1.1 kilometres until you reach the end of the forest on your right. Here a track leads into a farmhouse on your right. Follow this track for about 30 metres to its bend and from the bend head north-eastwards inside in the gully in the forest for 750 metres until you reach the tar road. This 750-metre walk is along the old Coach Road and along the way you cross over a forest road and then over and interesting stone bridge. Cross over to the other side of the tar road and follow the Coach Road again through the forest. This takes you back to the Upper Car Park where you started off from. Family Walk 3.3 kilometres (2 miles). Climb 130 metres (400 feet). Walking time 75 minutes. From the Upper Car Park walk southwards downhill along the tar road for 1.1 kilometres until you reach CHRIST THE KING STATUE near the Lower Car Park. You then follow the route from here back to the Upper Car Park via the Old Coach Road as described above in the Classic Walk. 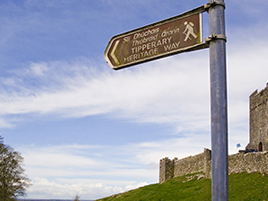 This walk is named the Heritage Way because of the enormous amount of heritage and history of South Tipperary which can be seen along the route. 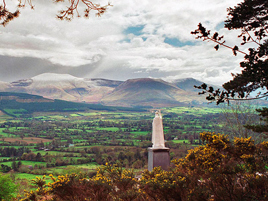 There are spectacular views of the Knockmealdown Mountains, as the walker meanders through a diverse range of habitats, including country roads, forest tracks, mountain tracks, river banks and open countryside. Archaeological and historical sites are located along the entire route and a local historian is available to explain the history of the area. There are many castles, monuments, abbeys and cemeteries along the Way, including Hore Abbey, the Rock of Cashel, Cahir Castle, Suir Castles and Swiss Cottage. The route can be divided into four easy stages: Vee to Ardfinnan, Ardfinnan to Cahir, Cahir to Golden and Golden to Cashel, the shortest route being of approximately two hours duration. It is suitable for all levels of walkers who can enjoy being at one with nature and discover the wide variety of flora and fauna of the region. The site was once part of the Chartersis Estate. 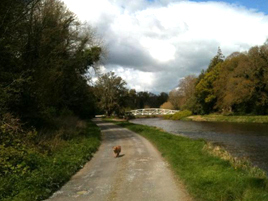 Located next to the River Suir and comprising of broadleaf woodland, this beautiful park is located 1 km from Cahir Town. Distance: Length of trail approximately 2km. Fauna: Mature beech, oak, Spanish chestnut, sycamore and other broadleaves, laurel rhododendrons and elder. Flora: Swans, duck and cormorants aswell as red squirrel, pheasant and woodcock. Facilities: Car park, picnic site, river walks and fishing. Walks to Swiss cottage. Clonmel Heritage Trail begins at the Town Hall along Dowds Lane where Bulmers Cider is produced and to Jail Gate in Gladstone Street which was built in the late 1700s. The trail leads to the North East Tower which was built as a lookout post, onto Short Street where it is said Cromwell breached the walls of the town. The town walls can be seen while on the way to Saint Marys Church, onto Anne Street and the Friends Burial Grounds. Visitors will then travel past the White Memorial Theatre, Irishtown, the West Gate built 1831, The Main Guard an office where tolls and customs were collected, the Franciscan Firary founded in 1269, along the Quays where huge buildings show how important Clonmel was as a trading town, past the Court House to Hearns Hotel. Bansha Wood The area was originally part of the Moor Estate and Moor’s Rock is situated 1 km. from the car park. From this rock there are panoramic views of counties Tipperary, Cork, and Limerick. There is a site of a penal church nearby. Flora: Douglas fir, scots pine, and sitka spruce. There are also replanted broadleaves such as oak, beech, holly and rowan. Also rhododendrons, which flower in late May and June. Fauna: Red squirrel and Fallow deer. Facilities: Car park and picnic site, viewing points and marked forest walks are all here to enjoy. This is a very quiet and peaceful area. The Aherlow Fáilte Society have for many years assisted in the maintenance of the area. Length of Trail: There are many walks available in varying lengths from 2.5km to 3.5km. Location: Located 6.5 km from Tipperary Town on the main N74 road to Cahir. Habitat: Forest roads and paths. There is a small pond at the car park. 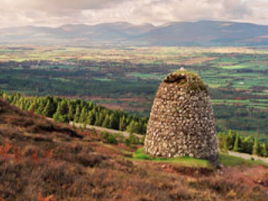 Rising as a huge heathery dome amid gentle green countryside, Slievenamon’s profile naturally attracts the eye. This is an easy mountain, and it could even be described as a beginner’s mountain, with a broad and clear track leading all the way to the summit cairn. On fine days there are extensive views, taking in all the best walking areas in the South East of Ireland. Nearby mountain groups look particularly appealing. 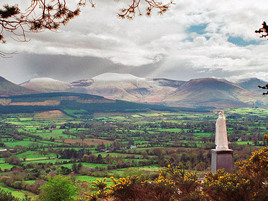 Slievenamon is a mountain of history and mystery of lore and legends. Its name means the ‘Mountain of the Women’ and the story is told how all the fairest women raced to the top to claim the hand of the warrior, Fionn Mac Cumhail. Fionn secretly fancied Grainne, the daughter of the High King of Ireland, so he advised her how to win the race! Although it looks like a solitary height, Slievenamon is surrounded by a series of lower heathery humps. Some of these, like the main summit, are crowned by ancient burial Cairns. The highest cairn is said to mark the entrance to the mysterious Celtic underworld. A more modern and prominent addition to the hill is the white landmark of Killusty Cross, erected in the Holy Year of 1950.The easiest route to the top of Slievenamon is clearly signposted from Kilcash, while another path from Killusty to Killusty Cross can be extended towards the summit. For more dedicated hill walkers, there is a complete circular walk around the hill, which is being promoted in the locality, as well as an annual hill race, and occasional guided walks. The area is called Bishop’s Wood because at one stage it was designated church property. The Earl of Montalt owned the state until 1905 and the remains of the gamekeeper’s lodge still stands in the woods. It is located in Dundrum, Co Tipperary. 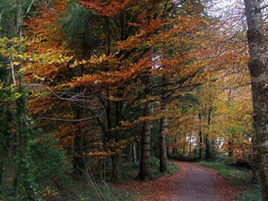 For a route contact call +353(0)61337322 or visit www.coillte.ie. 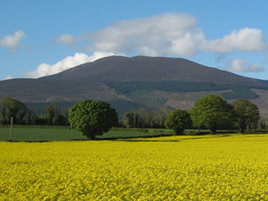 In many views, the Knockmealdown Mountains appear as a series of rounded heathery summits separated by deep gaps. Motor roads offering easy access to a range of fine hill walks cross some of the gaps. The mountains are also crossed by three major way marked ways, so that a variety of walking opportunities can be enjoyed. This mountain range is an important breeding ground for two endangered species, the red grouse and the hen harrier; cuckoo, nightjar, crossbill, buzzard and grasshopper warbler can also be seen. The public road leading from Clogheen Village by the car park was built during the famine. There is a cyclopean tombstone on the road just above the Vee, which marks the grave of Sammuel Richard Grubb, High Sheriff of County Tipperary. Directions: 2.5 km south east of Clogheen on R668 to Lismore. Flora: The area is planted mainly with Scots pine with some Douglas Fir and Sitka spruce near the car park. Other species include Corsican pine, lodgepole pine, oak, beech, rowan, larch, Spanish chestnut, bilberry, rhododendron, laurel, furze and heather. Fauna: Deer, fox, badger, stoat, mink, squirrel, rabbit and hare. Geology: Deep valley and lakes which are formed as a result of glacial activity thousand of years ago. The amenity car park on the route to the Vee is formed from an old red sandstone base. Facilities: Signposted famine burial ground. Overlooking the Vee note the upright, Grubb tomb. Car park, picnic site with seats on the riverside. Length of Trail: 3 km. The East Munster Way goes through the site and links up with the Tipperary Heritage Trail and the Blackwater Way at the Vee. Habitat: The park is situated in one of Irelands beauty spots at the commencement of the Vee Road which winds and turns for miles through heather and peat. The view from the Vee is magnificent with the Galtee Mountains in the distance and the countryside stretching out for miles. Bay Lough is a very beautiful lake further up past the Vee on the right hand side. 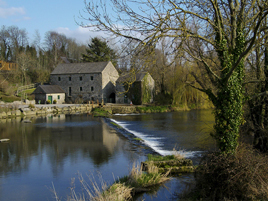 Mitchelstown is the ideal base to explore the walking trails of the three counties, Limerick, Tipperary and Cork. 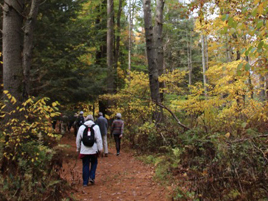 These walks offer fresh air, nature trails and marked walkways for you to enjoy and explore. Whether your interests lie in short, easy walks or long distance walking, whether you prefer guided walks or to organise your walking independently, walkers of all abilities will be invigorated by the sheer beauty and tranquility of the area. Walking in and around Mitchelstown can cater for any walking enthusiasts. There are exciting nature walks, river bank walks, quiet country roads, the Ballyhoura Waymarked Way, rugged mountains, rich bogs, and mythical landscapes. 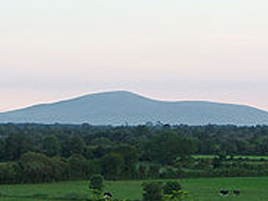 The East Munster Way stretches from Carrick-on-Suir to Clogheen, both in Co. Tipperary. 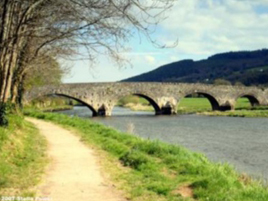 The first section of the Way from Carrick-on-Suir to Clonmel is along an old tow path of the River Suir, and through Kilsheelan Wood providing a host of scenic views in close proximity to the famed Nire Valley. 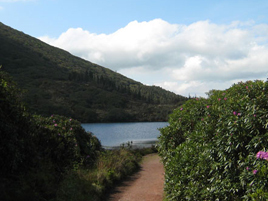 Between Clonmel Clogheen the Way takes to the hills and trends a route through the picturesque village of Newcastle along the forested flanks of the Comeragh and Knockmeldown Mountains, rich with a variety of flora and fauna. It links with the Wicklow, South Leinster and Blackwate Ways, forming part of a 500km waymarked route from Dublin to Killarney. Carrick-on-Suir, Kilsheelan, Clonmel, Newcastle, Clogheen. Longest Stage Newcastle to Clogheen 22km/14 miles. Highest Point Holy Year Cross, Glenary 350m/1150ft. 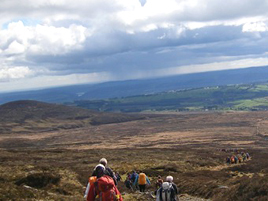 Hill walkers can climb the Knockmealdown Mountains from Newcastle and Clogheen on the northern side, or from Lismore and Cappoquin on the southern side. Any of these bases give good access to the higher parts of the range. Ground conditions are often dry and heathery, while forest tracks and narrow roads can be used to make easy approaches. The East Munster Way passes through the forests on the northern side of the range, while St Declan’s Way crosses a broad gap in the middle. One of the features of the higher Knockmealdown summits is a prominent linear ditch. This marks the boundary between counties of Waterford and Tipperary, rising and falling over a series of rounded tops and broad gaps, offering a useful navigational aid throughout. Views embrace everything from the coast to neighbouring mountain groups. Further westwards, the Knockmealdown Mountains dwindle in height, but still offer a fine variety of easy walks over gentler hills. Approaches can be made from the little village of Ballyporeen or the wonderfully quiet Araglin Valley. 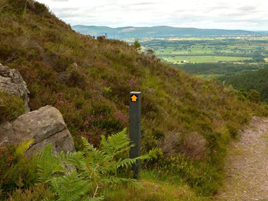 The Araglin Valley also features a good stretch of the way marked Blackwater Way, which can be followed to or from The Gap above Clogheen, where it links with the East Munster Way.